THIS IS FUNNY, I DON’T CARE WHICH SIDE YOU ARE ON! Forget the polls or the pundits, the season-opening skit on “Saturday Night Live” is the true measure of political dominance in America. 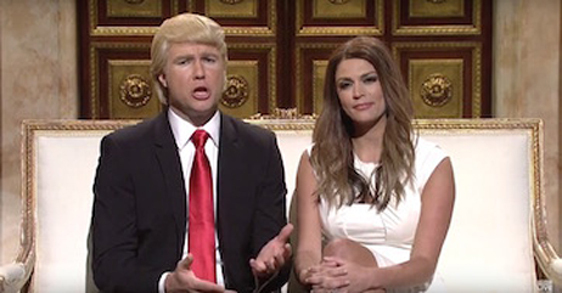 The kick-off cold open featured Taran Killam as Trump, announcing that he “clearly” doesn’t hate immigrants as he points to his foreign-born wife Melania, played by Cecily Strong. “SNL’s” writers couldn’t resist playing up Trump’s very public feud with Fox News host Megyn Kelly — Fox is a competing network, after all, and “SNL” writers are liberals in the first place. Pass this on to your friends on Facebook and Twitter, they will love you for it!